Few organizations have demonstrated the same level of commitment to helping NECC grow and thrive as our friends at Dunkin’ Donuts. We are thrilled to present them our Community Autism Champion Award for 2017,” said Vincent Strully, Jr., President and CEO of The New England Center for Children. The New England Center for Children® (NECC®), a global leader in education and research for children with autism, announced today it will honor Dunkin’ Donuts with its Community Autism Champion Award for 2017 at their annual Children of Promise Gala on November 17 at the InterContinental Hotel in Boston. Dunkin’ Donuts will receive the honor for their commitment to fund raising for autism education. “Dunkin’ Donuts is proud to help children with autism in our communities and beyond receive better educational services on their road to independence, and we are honored to receive this award,” said Neal Faulkner, Dunkin’ Donuts franchisee and NECC Board member. Dunkin’ Donuts is a long-time fund-raising partner in the Carlos Placido-Dunkin’ Donuts Golf Classic, an annual charitable golf tournament to benefit children with autism at The New England Center for Children. The Golf Classic has raised more than $2 million dollars in the past 20 years. More information about the Children of Promise Gala can be found at http://www.childrenofpromisenecc.org. Founded in 1950, Dunkin' Donuts is America's favorite all-day, everyday stop for coffee and baked goods. Dunkin' Donuts is a market leader in the hot regular/decaf/flavored coffee, iced coffee, donut, bagel and muffin categories. Dunkin' Donuts has earned a No. 1 ranking for customer loyalty in the coffee category by Brand Keys for 11 years running. The company has more than 12,400 restaurants in 46 countries worldwide. Based in Canton, Mass., Dunkin' Donuts is part of the Dunkin' Brands Group, Inc. (Nasdaq: DNKN) family of companies. For more information, visit http://www.DunkinDonuts.com. 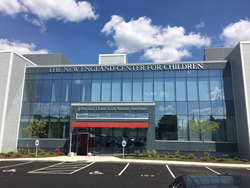 The New England Center for Children® (NECC®) is a world leader in education, research, and technology for children with autism. For more than 40 years, our community of teachers, researchers and clinicians have been transforming lives and offering hope to children with autism and their families. NECC’s award-winning services include home-based, day, and residential programs; public school partnerships and consulting; the John and Diane Kim Autism Institute; and the ACE® ABA Software System used by more than 4,620 students in 24 states and nine countries. NECC received the 2017 Award for International Dissemination of Behavior Analysis from the Society for the Advancement of Behavior Analysis (SABA). A 501c3 non-profit, The New England Center for Children is based in Southborough, MA, and also operates a center in Abu Dhabi, UAE. More information is available at http://www.necc.org.